Conflict and persecution produce tragedy unimaginable to those of us who reside far from lands where gunfire sounds or where human rights are threatened. 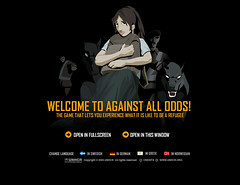 To raise awareness of the plight of the world's refugees -- the thousands who have fled their homes to seek asylum -- the Office of the United Nations High Commissioner for Refugees (UNHCR) has created Against All Odds, an online game that seeks to build understanding of the grim realities that face the 1 out of every 300 people world-wide who are refugees today. The Against All Odds web site includes a teacher's guide and a fact sheet. This is of course not the only use of online games to teach social messages. You can read more at the following posts: "War games: digital technology provides medium for educating and influencing" and "USC students develop virtual game to bring real-world attention to Darfur crisis". Thanks to Thinking Ethics for the link. Time for a change: Is mediation ready for reform?